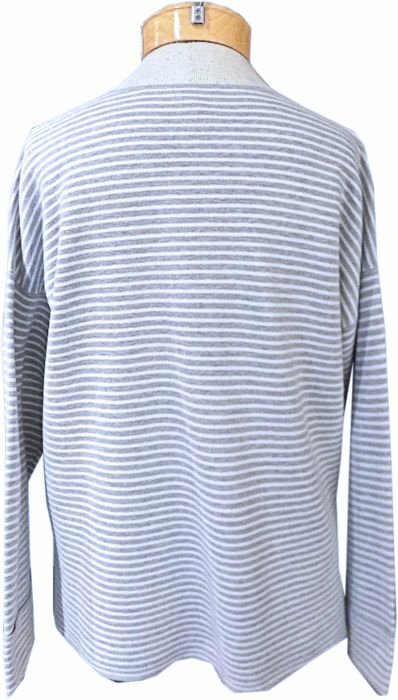 We always get excited with Eileen Fisher's mini stripe fabric, and now she's done the mini stripe with a luxurious cotton/nylon/silk blend that is heavenly! A substantial feeling fabric that is smooth and gorgeous feeling. The folded sleeve cuffs, side slits and drop shoulders all add great detailing that make this pullover feel even more special and cool. We're going to throw this on with our graphite jersey cropped pants, or white linen trousers. 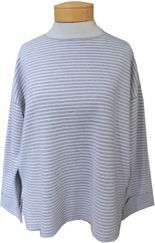 Even when the days warm up this would be a great top to wear over a white tank, and then wear over your shoulders and tied at the front when it warms up in the day!